When is the best time to go on a cruise on the Yangtze River in China? However, the “BEST” time might be different according to whether you are looking for the months for the most beautiful sightseeing, most comfortable weather, or the best prices. Actually, all months are good time to enjoy the Yangtze River cruise, and you could get different but great and unforgettable experience if go in different seasons. Spring and Autumn are two peak seasons for the comfortable weather and best splendid sceneries of the Yangtze River. Summer is the best season for family tour with nice discounts. And winter is the best time to enjoy the low price and less crowded environment. You can check each season and the detail months to select the best time match your needs and start your visit to Yangtze River cruise in China. Spring on the Yangtze River is mainly from March to May. The temperature gradually rises up and various flowers blooming lush and verdant to treat your eyes. You could have a really comfortable experience while visiting the shore excursion sites along the river. Although, it rains increasingly during spring, you can also enjoy the warm sunshine and the nice natural view of the Three Gorges and other famous attractions. Yangtze River spends the best autumn season during September and November. The not too hot and not too cold weather would give you a comfortable and relaxing holiday. There are fewer fresh flowers than in spring season, however, the charming sceneries and view of the countless rich fruits like local oranges covering all the hills on the two banks still are praised by numerous visitors and recorded by their cameras. However, during the Labor Holiday (around May 1st) and the National Holiday (mainly during late September and Middle October), travellers usually travel to release their pressure, so there would be many people. So if you want to enjoy the Yangtze River cruise, you are suggested avoid such crowded periods. June to August is the summer season on the Yangtze. Though it is really hot outside, all Yangtze River cruises have been facilitated with advanced central air-conditioners to give you a COOL summer. Moreover, the multiple activities, delicious food and beverages, and luxury cabins and suites are prepared with high standards for your retreat holiday with your children on summer vacation and other family members. Besides, with fewer travellers onboard, you would enjoy the cruise with so nice discounts, better than during the peak seasons. It comes to winter during December to the next February along the Yangtze River. during this season, especially in December, the Three Gorges is dyed into fiery red by the full mountains of red leaves, which is really impressive and splendid. In this off season, the level of water becomes low, so there are fewer cruise ships sailing on the Yangtze River. But to enable you enjoy the still pretty sightseeing of the Yangtze and the Three Gorges, the Victoria Cruises and Century Cruises offer the winter deals with the best low prices, which give you a big saving for enjoying more destinations in China. Furthermore, in winter season, there are much fewer travellers, so you can totally enjoy the Yangtze River cruise with less crowded but more space onboard. Since your Yangtze River cruise stars and ends at the port cities, knowing about the weather there are better for your preparation of the cruise trip. Let’s see the weather in the major port cities at below. Chongqing belongs to the subtropical monsoon moist climate zone, with an annual average temperature of 16-18℃. Known as the “hot city” in China, Chongqing has very hot summer with the highest temperature over 35℃ and over 40℃ for extreme conditions. It is also called the “City of Fog”, it usually foggy totally for 100 days averagely every year and moist during four seasons. Check more details about Chongqing weather. Yichang also has a subtropical monsoon moist climate. It has four distinct seasons, with the raining and hot seasons appear at the same time, and the drought and cold seasons the same time. The average precipitation is about 1,245.6mm every year, and annual average temperature is about 16.9℃. 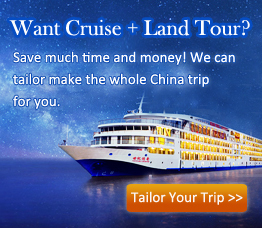 Plan a China Tour with Yangtze River Cruise? Check our top Yangtze River tours which cover the classic highlights of China with a luxury cruise on the Yangtze. Remember, all can be customized to satisfy your needs.